When you think about taking a trip like this one, and if you’re not a motorcyclist, you might find it hard to imagine all of the logistical details that you need to take care of, if you’re going to have an enjoyable and successful trip. Let’s say that you’d like to drive a car around Europe, or even across Asia, you’d probably rent a car, and drive that car throughout Europe, and Asia. Renting a car is probably your only real choice. Simply put, cost of shipping your own, personal car to Europe would be prohibitive, and it would be relatively easy to rent the perfect car for your trip. But, if you’re a motorcyclist, size matters. We motorcyclists, especially those of us that are 6’5″ tall go to extraordinary measures to get our bike to fit us perfectly. In my case, I’ve spent about $6K in specialized parts that make the bike fit me ergonomically, and that the suspension is setup perfect for someone my size. 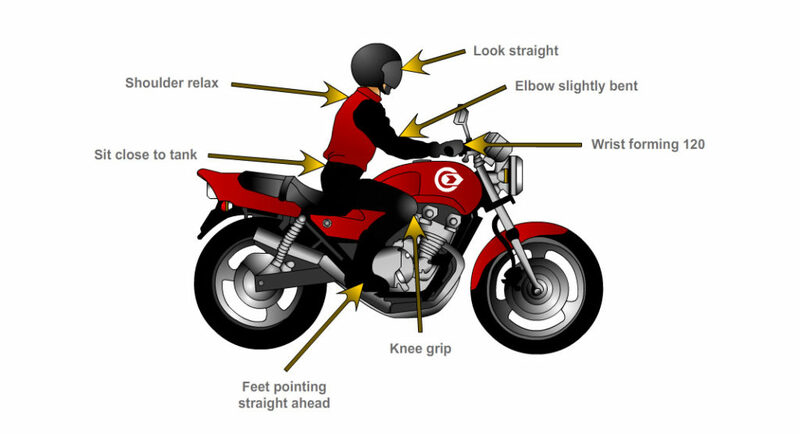 This picture is somewhat simplified, but it illustrates how important it is to have a bike that fits you properly. You can see that, for a tall rider, in order to have the right height of my arms, and the right angle for my legs, I’ll need to sit back further, with taller handlebar mounts. I’ve addressed all of these fitment issues, but this picture is very illustrative. But, beyond these simple, easy to understand questions, there are the issues that come from differences between a motorcycle’s service schedule, and the service schedule for a car. Motorcycles require service to be performed about every 3000 miles. And at each 6000 mile interval, a more elaborate and more comprehensive service needs to be performed. Motorcycle tires tend to wear out anywhere from 6000 to 10,000 miles, depending on the tire, and the roads traveled. In my case, the tires that I’ve chosen (The Michelin Anakee Wild) are expected to last about 6000 miles. The trip is expected to last for about 18,000 miles, so even if I put on a brand new set of tires before the trip, I’m still going to need to change tires twice during the trip. Imagine, you’re going to need to change the oil, replace filters, replace tires, tune the fuel injection, and perform a number of other daily, and interval-driven tasks. All of these tasks require parts, but you’re on a motorcycle, and you’ve got almost nowhere to store these parts on the bike. It’s really not practical to stack up 3 sets of tires on the rear of the bike, and then travel 18,000 miles, slowly removing the tires as the old ones wear out. So, what’s the solution? Logistics and planning, that’s what. I’ll need to think about each piece of hardware (spare parts) that I’ll need to have along for the ride. I’ll carefully consider which parts I will carry on the bike, and which parts I’ll have the tour operator purchase on my behalf, and carry along in the transport van. Once I’ve created a list of the parts, I’ll then need to decide which parts I’ll take with me, and which ones I’ll have the tour operator purchase on my behalf. So, the problem is solved, right? No, not so fast Boba Boy… I’ll do the thinning around here. You see, performing maintenance on a motorcycle can be quite complex, and it is not something that any rider should take for granted. Which leaves the question… If I’v got the parts, how do I get the maintenance performed? Finding an expert in Kazakhstan is easy, right? While I don’t have all of the information needed to speculate on exactly how easy it is to find a qualified BMW mechanic in any of these countries, I can imagine that it might be very hard, or otherwise impossible to find someone qualified to perform this work. So, I’ll need to think very hard about every mile of the journey, and every stop along the way. Choosing to use a reputable dealer for the complex service stops, and performing the work myself, for the simpler work. As you can see, there are more BMW dealers in Kazakhstan than you might imagine. So, perhaps the problem is more easily solved than I would imagine. And so, my plan is complex, but for all of you that know me, I relish the idea of solving complex problems, and so this problem is just like all the rest, as far as I’m concerned. This problem can be solved by being thoughtful, and detail-oriented. The tour operator (Edelweiss) is willing to help me quite a bit, but in their documentation, they stress that a world tour expedition, such as this one, should only be undertaken by people/riders that are accountable to maintaining their own motorcycles. We are told that we must not rely on others, but instead, we must be self-reliant, and self-sufficient. And so, in closing, it seems that the logistics of motorcycle maintenance are quite complex, but with a little thought, and a little help from Edelweiss, and BMW shops along the way, I’ll get by, and be ready for whatever the road throws at me. I’ve read that because the Anakee Wild is a radial tire, it is not necessary to “air down” when riding off road, then air back up on pavement. Hi Bill, I had not heard that the Anakee Wild offers the benefit of keeping the pressure stable, instead of letting air out. I will say however that the Anakee Wild is a 50/50 tire, and as such, it has a tremendous amount of off-road chutzpah. So, perhaps its just the increased off-road ability that makes the difference.